Meet Boogity Boogity Boogity.. 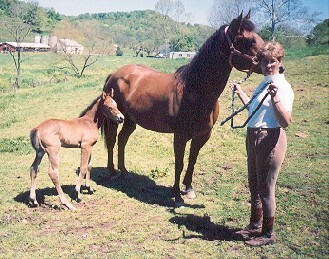 He was foaled April 9th.. wasnt due till the 11th.. Holly couldnt wait to have him. 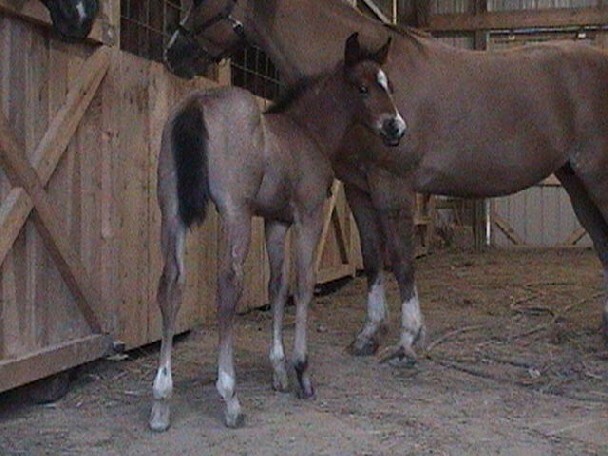 He has NO WHITE MARKINGS.. Not sure on his color yet..
Zip A Holly is his Mother and his full sister is Smokin Zip a Roo..
"Cuss" This COLT arrived on March 19, 2003. He is out of a RED DUN MARE. sure what color he is going to be. 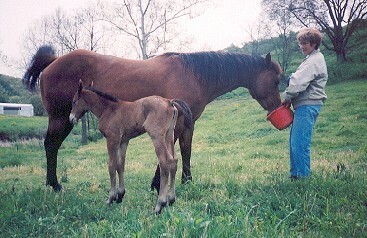 Dude's 2003 Filly - Foaled on April 24, 2003.. she is a couple hours old here. She also has roan hairs in her flanks. She is 3 days old in this photo. 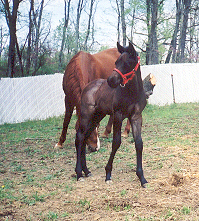 Barbs Image of Dry had a FILLY on April 24, 2003.. Will Post PHOTOS as soon as possible..
All the babies for 2003 are on the ground.. 3 colts and 2 fillies... so far 1 grey colt, 1 blue roan colt, the 1 filly looks to be going red roan.. dont know about the other, never got any pictures of her (Barb's baby) and the last colt has grey around his eyes and white hair in his flanks..